The Pushpak Aircraft, by Balasaheb Pandit Pant Pratinidhi, 1916. In addition to the very interesting divine vehicles associated with Yahweh (the God of the Christians and Jews), many gods and goddesses have driven massively cool vehicles. In fact, as I point out elsewhere, many of their avatars (changed aspects) may be the vehicles themselves rather than a transformation of the deity. Divine chariots are described quite a bit in the Bible, and also are described a lot in religions around the world. For instance, ancient Hindu texts are crammed full of descriptions of various types of flying chariots — vimanas — and information on how to make them, fuel them, and control them. A chariot of the gods, any mythical self-moving aerial car, sometimes serving as a seat or throne, sometimes self-moving and carrying its occupant through the air; other descriptions make the Vimana more like a house or palace, and one kind is said to be seven storeys high. The Pushpaka chariot that resembles the Sun and belongs to my brother was brought by the powerful Ravana; that aerial and excellent chariot going everywhere at will …. that chariot resembling a bright cloud in the sky … and the King [Rama] got in, and the excellent chariot at the command of the Raghira, rose up into the higher atmosphere. Rama being welcomed back to Ayodhya. He is also shown flying in the celestial flying machine, the Pushpak Vimana. The Thunderbirds of the Native Americans are similar to the flying things called “gods” by very many ancient cultures — and similar to the United States Air Force Thunderbirds of today. See my post on Thunder Gods, Such as Yahweh…. The Persian king Kai Kavus built himself a Flying Throne and flew it to China. King Solomon reportedly had a flying carpet 60 miles square that could “get from Damascus to Medina within a day”. The wind once caused the carpet to drop 40,000 people to their deaths, due to Solomon having too much pride. The Greek god Helios drove the Chariot of the Sun across the sky every day; it was drawn by fire-darting steeds. Phaëton, his son, borrowed the chariot, but lost control and plunged into the river Eridanos. Thor drove his Chariot of Thunder across the sky; it was pulled by his two magic goats, Tanngrisnir and Tanngnjóstr. Poseidon frequently drove his Chariot of the Sea through and atop the ocean, pulled by hippocampi (sea-going horses with fish-like hindquarters). Kali with her chariot Vitthakalai. Maa Kali drives a gold-decorated chariot called the Vitthakalai. Sol, the Norse sun goddess, flew in a chariot pulled by the horses Arvak and Alsvid, whose manes shone like the sun. Dionysus’s chariot was pulled by panthers, tigers, or centaurs, or by a bull, a panther, and a griffin, or something — as usual, no one was exactly clear on what they were seeing. 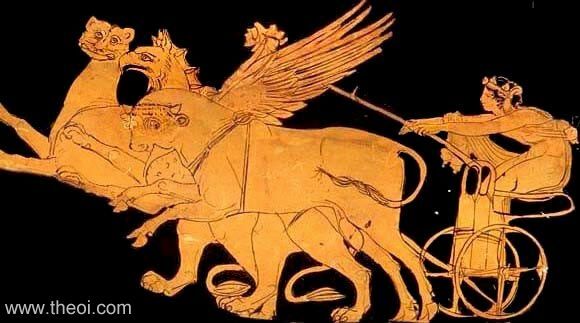 Dinoysius driving his chariot pulled by a bull, a panther, and a griffin.